Aegeon beach hotel is located at the southest part of Athens Riviera, in Sounio. Just under the ancient Temple of Poseidon and enjoying the unique privilege to be on a natural sandy beach, Aegeon hotel claim a superb sea view of the world known sunset of Sounio. By car from Eleftherios Venizelos International Airport. Follow the sign that says Markopoulo, it’s on your left. Take the Markopoulo exit. Upon exiting stay on course and follow the sing that says Keratea-Lavrio. Your destination is Lavrio. 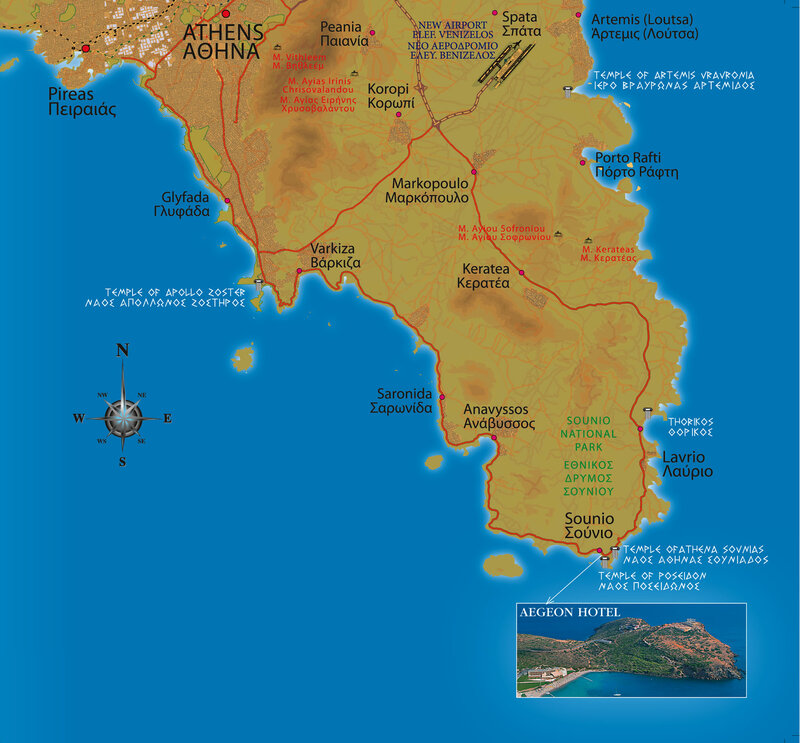 Pass Lavrio and go towards Sounio. After 9km, pass the first crossroad and stay on the right handsite. There are 2 ways , by cost and by inlandBy coast: Follow the signs that says Sounio through Vouliagmeni Ave. or through Glyfada townFrom both ways you meet Varkiza , you turn left and you stay on cource following the sign for SounioBefore the 68th km Athens-Sounio Ave. you will see the Temple of Poseidon overlooking the placeAegeon hotel is just under the TempleBy inland: Enter the Attiki road and folllow the sign that says Markopoulo. Then use the same informations from the Eleftherios Venizelos International Airport above.